Finally. Breeze the pedometer app synchs with runkeeper. When we first did our review of Breeze A Gorgeous Step Tracking And Motivation From Runkeeper, we loved it because it did one job and did it incredibly well tracking your Walking activity with style and panache. 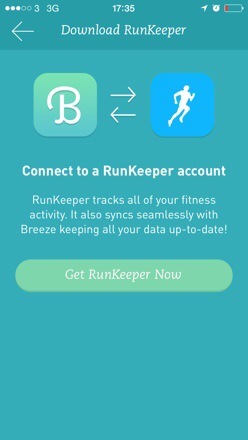 With version 1.2 you can now connect your activities in breeze to runkeeper, a feature most users have been clamouring for. Continue reading → Finally. Breeze the pedometer app synchs with runkeeper.